Located in central Colorado on the west side of the Continental Divide, the Roaring Fork Watershed includes the Sawatch, Collegiate and Elk Ranges and eight 14,000 foot peaks. Melting snow in these headwaters collects and joins one of three main rivers (Roaring Fork, Fryingpan, and Crystal) and drains to the Colorado River in Glenwood Springs at an elevation of 5,916 feet. Encompassing an area of 1,451 square miles, the Roaring Fork Watershed is approximately the size of Rhode Island. Part of the larger Colorado River Basin, which supplies water to over 30 million people in the arid southwest, the Roaring Fork Watershed contributes about 940,000 acre feet or 306 billion gallons of water each year to the Colorado River. In the West, it is commonly known that water flows downstream unless it flows upstream towards money. We would add “money and people.” This adage is true in the state of Colorado. About 80% of our population lives on the Front Range while about 80% of the state’s water is on the Western Slope. Beginning in the 1930s, transmountain diversions that move water from west to east were built to help meet the demands of the more populous Front Range. Today, Colorado has 24 major tunnels that move water from western Colorado to eastern Colorado under the Continental Divide. 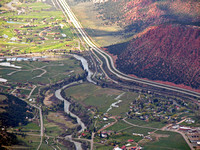 Two of the five largest diversions are located within the Roaring Fork Watershed. The Boustead tunnel moves water from the upper Fryingpan River and Hunter Creek drainages to Turquoise Lake near Leadville. The Twin Lakes tunnel diverts water from the Roaring Fork River headwaters to Twin Lakes on the other side of Independence Pass. This time of year, as tunnels move water and reservoirs fill, as much as 40% of the water in these headwaters areas is not flowing downstream. Working with individuals and groups who are concerned about the future of the Roaring Fork’s dwindling watershed, EcoFlight has flown issues ranging from proposed wilderness areas, to urban development, to open space lands in a proactive effort to educate and advocate for the conservation of the Roaring Fork River. As demand for water increases in the future, the Roaring Fork Watershed’s transmountain and in-basin diversions will play a major role in Colorado’s water future. Learn more about transmountain diversions and the Roaring Fork River at www.roaringfork.org/diversions.